There are not any in person events planned at this time. See below for more! What are the tools to renew our minds and, in so doing, renew our businesses and nonprofits in extraordinary ways? Come join us at Crossover Network where we discuss the Trinity's fascinating keys for renewed, successful, and sustained stewardship! Executive-in-Residence and Distinguished Professor at Colorado Christian University’s School of Business and Leadership. Crossover Network is back in the DTC! Crossover has moved digital and there are not any in-person events planned at this time. Stay tuned for more information. Look for updates via email, website, or FaceBook to learn how Crossover Network will be serving you in 2018! 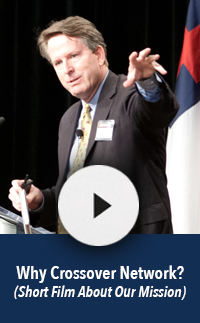 Integrating faith in the workplace has long been a focus for us: founding Dean and current SBL Executive-in-Residence Kevin Miller was the featured on-air personality for both the Executive Notebook radio outreach in Colorado and the Go Beyond radio series broadcast nationally on the K-Love radio network. For years, Crossover Network brought together leading business and nonprofit leaders to network and enjoy cutting-edge teaching, integrating faith and timeless organizational principles. We have concluded these monthly meetings serving Denver and the Front Range and are researching other exciting directions to continue proclaiming of the gospel of the Kingdom of God. CCU's School of Business and Leadership will continue to sponsor high-impact in-person events like its popular annual Values and Leadership Summit (VALS) as well as other periodic gatherings in the spirit and thrust of the Crossover Network. Stay tuned for notices related to such events!